It is ONLY an issue in the eyes of westerners who see Chinese=70%Singaporean, therefor the strange connection of China influencing Singapore. In PRC, it is 中国 the country vs. 汉人 (the so called Chinese in western concept). 70% of Singaporean are 汉人, the culture and ethnic entity. 汉人 does NOT equate to 中国人 (the people of China) even though 汉人 makes up 90% of the population. No Chinese state modern or ancient has ever equated the two concepts. It is ONLY an issue of the westerners and west-brainwashed Chinese nationals based on their racially based concept of nation state. The problem can only be addressed by NOT getting into the debate point-to-point. But instead call out the fundamental fault, that is to demand the NYTimers to re-educate themselves of the truth in other part of the earth, shaking off their western-centric non-sense. I agree that ROC (KMT) and the PRC (up till 1960s) regard oversea Chinese as Chinese citizens, which they must because these Chinese are not British citizens even when they live on British colonial territory. However, I see that policy choice as the only choice rather than a preferred choice because the reason above. As of Chinese imperial dynasties (not limited to Qing), it is almost impossible to discuss the subject because the very concept of Sovereignty (the base of citizen(republic)/subject(Imperial)) is different between China (then) and today. Chinese empire regards everybody under the heaven subject of the son of heaven, there is no fundamental difference between a person from China proper and another person in Southeast Asia being an imperial subject. Now when touching the practical matters. Chinese subjects (from the proper) who left territory directly ruled by the Emperor settling abroad WITHOUT official sanction were treated as 自外于天朝, something equal to betrayal. In modern sense it is "renouncing Chinese citizenship", certainly not what you may think. This is the attitude of both Ming and Qing. Take Ming's dominance of Vietnam for example, Ming attempted to change Vietnam to a province in the early 1400s, if succeeded, everybody in Vietnam would have been fully Ming (Chinese) subject. When it failed, Ming and subsequently Qing never bothered to control or rule or protect anybody in Vietnam with ancestry from China proper, regardless them being Han, or Miao etc. Through all the readings by myself, I have never heard of imperial Chinese dynastic government paid any positive attentions to people left their rule. The only case I am aware of is 海禁, (blockade of going oversea), both in the Ming and Qing dynasties. Once again, one has to drop the western concept of nation state which has a clear boarder and exclusive non-overlapping rule over population and territory when talking about the policy of imperial China. Otherwise, the discussion will become so messed up like Chicken talking to Duck. Through all the readings by myself, I have never heard of imperial Chinese dynastic government paid any positive attentions to people left their rule. The only case I am aware of is 海禁, (blockade of going oversea), both in the Ming and Qing dynasties. The diplomatic practices of the late Qing were reformed to be modeled after the Western nation-state, and hence China's diplomatic corps attempted (at least nominally) to protect its citizens abroad and establish positive relations with overseas Chinese. Equation and Hendrik_2000 like this. Kapitan Cina, also spelt Kapitan China or Capitan China (English: Captain of the Chinese; Chinese: 華人甲必丹; Dutch: Kapitein der Chinezen) was a high-ranking government position in the civil administration of colonial Indonesia, Malaysia, Singapore and Borneo. Office holders exercised varying degrees of power and influence: from near-sovereign political and legal jurisdiction over local Chinese communities, to ceremonial precedence for community leaders. Corresponding posts existed for other ethnic groups, such as Kapitan Arab and Kapitan Keling for the local Arab and Indian communities respectively. The origin of the office, under various different native titles, goes back to court positions in the precolonial states of Southeast Asia, such as the Sultanates of Malacca and Banten, and the Kingdom of Siam. Many rulers assigned self-governance to local foreign communities, including the Chinese, under their own headmen. Often, these headmen also had responsibilities beyond their local communities, in particular in relation to foreign trade or tax collection. For example, Souw Beng Kong and Lim Lak Ko, the first two Kapiteins der Chinezen of Batavia, present-day Jakarta, started off as high-ranking courtiers and functionaries to the Sultans of Banten prior to their defection to the Dutch East India Company in the early seventeenth century. 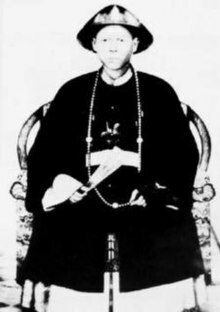 Similarly, the court title of Chao Praya Chodeuk Rajasrethi in Thailand under the early Chakri Dynasty combined the roles of Chinese headman and head of the Department of Eastern Affairs and Commerce. 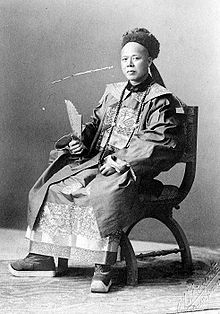 In the late nineteenth century, Kapitan Cina Yap Ah Loy, arguably the founding father of modern Kuala Lumpur, capital of Malaysia, served as Chinese headman while holding the Malay court position of Sri Indra Perkasa Wijaya Bakti. When Europeans established colonial rule in Southeast Asia, this system of 'indirect rule' was adopted: first by the Portuguese when they took over Malacca in 1511, then in subsequent centuries by the Dutch in the Dutch East Indies, as well as the British in British Malaya and Borneo. Use of the title 'Kapitan' in the civil administration has parallels in the sixteenth-century, colonial Portuguese Captaincies of Brazil. Equation, badoc and Icmer like this. That was true, and I should have mentioned it as well. But that is not really the "Chinese" practice, but western practice that was forced upon China, pretty much the same as later ROC and PRC. If it was up to the then Chinese imperial government, they would not have done so, would they? 1850 is the line that separate the Chinese world order and modern western based world order, everything after that line was pretty much non-Chinese. The original topic was "1st the imperial Chinese government practice towards oversea Chinese and 2nd ROC and PRC practice". My response was to the 1st which I should have stressed the 1850 cut-off line. Make up your mind Mahathir. If you don't need the projects, why do you want renegotiation? P.S. don't play the book of Trump. Contract is contract, how do I know you or your successor will stick to the "renegotiated" contract? Good, then drop it. China is ok so long as every compensation term in the contract is fulfilled. That's why these terms are there for. All terms are in the contract, all money spent is in the book. Mahathir does not need to come to Beijing to know if it is doable to scrap the contracts. So he should not play fool. P.S. He is over 90 years old, he should have some self-respect at this age. Put on hold is ok, just go through the terms. P.S. China is not going to dance with Malaysian's domestic political rivalry games. bluewater2012, Shaolian, montyp165 and 2 others like this. OBOR crosses quite a number of countries that have less than stable governments. I imagine China anticipated these kinds of scenarios. The good thing about long-term planning is that you can always out wait these silly little political games. bluewater2012 and montyp165 like this.